"We're not a band, we're a lot." No arguments there; they’ve been packing out stages from London to New York in matching t-shirts bearing the Tomb Crew legend for the last two years. With two DJs and one MC, they launch dancefloor destroying mixes of anything bass heavy - from house to dubstep and everything inbetween. As the legions of grinning converts –everyone from grime heads to indie kids - will attest, Tomb Crew are very much the inebriated and debauched sound of Fun. You know what that is, right? You could see Tomb Crew as part of the rapidly growing ‘new-bass’ scene – also containing Mumdance, L-Vis 1990 and Oneman - but the truth is they have the mash-up principle down perfectly, the live show to end all live shows..
As well as the live shows, J@peg - the crew's producer - has been honing crafting with his bmore influenced dubstep/kuduro on remixes for Crookers, Drop the Lime, Oh Snap!, Totally Extinct Dinosaurs, Last Japan, Let’s Go To War, and many more. With remixes already released on the Hot Chip affiliated label 'Greco Roman' and Fat Boy Slim's Southern Fried as well as an original release on former Bomb funk MCs Rico Tubbs Bass=Win Record label, Tomb crew's production output is continuing to increase. Tomb Crew productions have seen support from Toddla T, Tayo, Crookers, Sinden, Brodinski, Trouble & Bass Crew, DJ Yoda, Joe Hot Chip, Mistajam, Congorock, Doorly, Rob Da Bank, Eddie Temple-Morris and many more. With hundreds of dancefloors smashed since their inception in 2007 it is only a matter of time before they explode - from East London to the world..! 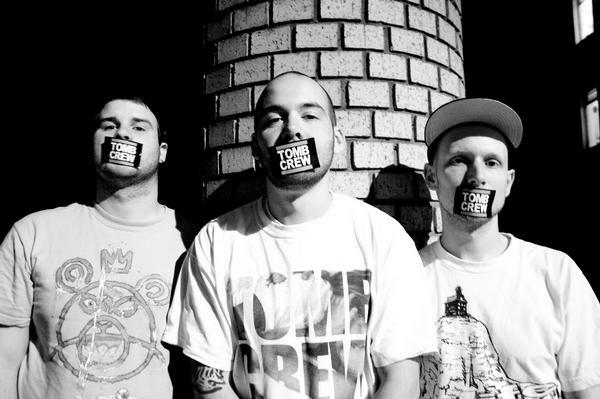 Tomb Crew have played with -Public Enemy, DJ Zinc, Herve, Kazey & Bulldog, Rusko, Sinden, N-Type, Plastician, Benga, Loefah, Skream, Dexplicit, Lethal Bizzle, Chase & Status, BodyRox, Shy FX, Remarc, Toddla T, Oneman, Martelo, Pendulum, Tchiky Al Dente, Boy Better Know, Jammer, Tayo, DJ Q, Drop The Lime, Starkey, Tinchy Stryder, Andy George, Youngsta, DJ Hype, Mista Jam, Jack Beats, Kissy Sellout, Lvis 1990, Foamo, Ruff Sqwad, The Nextmen and many, many more. Tomb Crew have played at - Fabric (London), Matter (London), LOVE (New York) Hiro Ballroom (New York), Noveau Casino (Paris, France), Favela Chic (London & Paris), KOKO (London) La Nau (Barcelona, Spain), Fabrica (Bucharest, Romania), Sudpol (Luzern, Switzerland) Academy (Manchester), Scala (London) , Docks Du Sud (Marseille, France), Glade Festival, Big Chill Festival, Underage Festival, Spring Festival (Graz, Austria) Lovebox festival, Great Escape Festival, Offset Festival, Outlook festival (Pag, Croatia) and hundreds more. For more info/guestlist check out the Facebook Event Page.